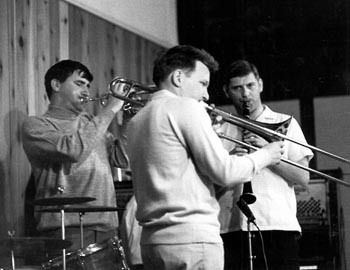 Trombone player Jackie Free was born in Leytonstone, East London, on the 28th March, 1932. He was into music from an early age, playing trombone in the local Boys Brigade band, which won quite a few competitions, even appearing at Belle View in Manchester and coming second in the final. 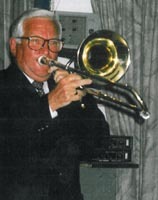 Jackie did his National Service from 1950 to 1952 in the Royal Air Force and managed to play with many service bands and for dances in the Officers’ Mess. 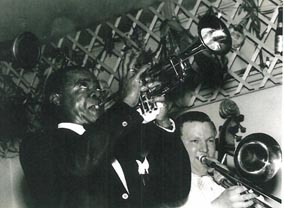 After demob, he played some local gigs before he joined the Harry Walton Jazz Band in 1954. 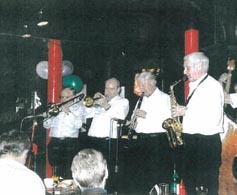 After six years with Harry Walton, Jackie left and freelanced for a short time, playing with fine musicians such as Alan Wickham and Gerry Salisbury. Then, in 1962 he joined Freddy Randall and his band. 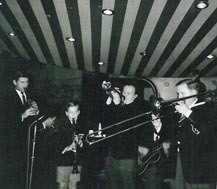 Click here for a Movietone News video of the band playing on this occasion in 1964 at Wood Green Jazz Club. ‘On another occasion we were asked to play at the opening of a pub called The Cauliflower. We started playing to about eight or ten old fellows who were drinking at the bar and got no acknowledgement at all. The pub slowly filled up and the gig went OK, but at the end, one of the old boys came up and said, “You here again tonight?” “No, sorry,” we said. “Thank God for that,” he mumbled. Jackie left Dave Shepherd’s band in 1970 to freelance again. He played with Joe Loss’s Ambassadors Orchestra and then around 1980, he joined drummer John Petters’ band and toured with Billy Butterfield (the trumpeter with Bob Crosby’s Bob Cats), and played and recorded with Wild Bill Davison, Yank Lawson, and veteran pianist Art Hodes. In the 1980s, Jackie formed his own band Jack Free and the Chicagoans. ‘Over the years I have had some fine musicians playing in my band,’ he says. ‘ People like Digby Fairweather, Mike Cotton, John Patey, Dave Shepherd, Enrico Tomasso … I have made three albums so far. My first CD had John Patey (trumpet), Julian Marc Stringle (clarinet), Nick Dawson (piano), Murray Salmon (string bass) and Martin Guy (drums). In early 2009, Jack was having trouble with his heart again: I could hardly walk to the door,’ he says. ‘I went to see the consultant in London who told me that I needed another heart by-pass, but there was a likely chance I would die on the operating table. He said he wouldn’t have it done. I wasn’t happy with this, so was referred to Papworth Hospital where they did a triple bypass and fitted a pacemaker – now I walk two miles a day’. In November, 2009, Jackie and the band were in the recording studio making that third album ‘Jackie Free’s Chicagoans’ – fifteen tracks of favourites like Wolverine Blues, Baby Won’t You Please Come Home, Fine And Dandy, When It’s Sleepy Time Down South …. The CD is not available through commercial outlets, but Jack has a number copies available – if you would like a copy at £10, Jackie has a few available - contact him by clicking here if you would like more information. Now in his eighties, Jack is feeling fine and plays regularly around the country with other bands as well as with his own – London, Watford, Lincoln, Bournemouth, Bracklesham Bay … ‘I hope the gigs will keep coming in,’ he says. In September 2014, a blue plaque was unveiled for Jackie in Pearcroft Road, Leytonstone. For several years, the National Jazz Archive has been working alongside Waltham Forest to identify the residences of jazz musicians within the Borough which covers Leyton, Leytonstone, Walthamstow and Chingford. 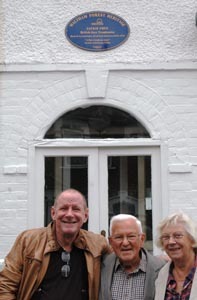 The National Jazz Archive says: In 2013, Waltham Forest arranged for plaques to be placed on houses previously occupied by Sir John Dankworth, one of the finest British jazz musicians and composers whose work is known both by jazz fans and the public at large, and of clarinettist Dave Shepherd who, in his career, has played with Billie Holliday, Gerry Mulligan, Teddy Wilson, founder of the Archive – our own Digby Fairweather, and many other renowned jazz performers. 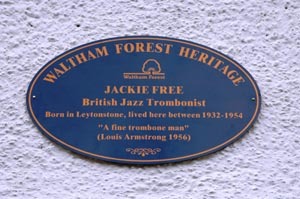 Recently, a plaque was placed on the house in Leyton where trombonist, Jackie Free, spent his first twenty five years and learnt the trombone at the local Boys Brigade. Jack Free's All Star Band with Jack Free (trombone), Peter Rudeforth (trumpet), John Crocker (clarinet), Tim Huskisson (piano), Murray Salmon (bass), Martin Guy (drums). I am sure that there are people who will search the lists of new releases each month looking for a new Trad Jazz album and come away disappointed. Not this month. 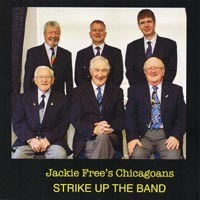 Recorded at the end of 2013 and now available on CD, Jackie Free’s Chicagoans are back with an album of Dixieland favourites in the Eddie Condon style. This is a well-established UK band that knows about playing Trad. and the track list contains many favourites from Indiana and Memphis Blues to Beale Street Blues and It Don’t Mean a Thing. Although the band plays well together, as they should by now, I have to single out John Crocker (clarinet and occasional tenor saxophone) and Peter Rudeforth (trumpet and flugelhorn) who play some fine solos on this album, and Tim Huskisson who has a nice light touch on piano. Jackie Free made the recording a week before he went into hospital and so understandably he holds back more than usual on trombone, but make no mistake, his is an essential contribution to the band and he gives us well-judged solo on Basin Street Blues. Martin Guy on drums and Murray Salmon on double bass provide a reliable foundation for the music. I think the album is more satisfying on the traditional numbers that are included in the fifteen tracks on the album. Of the others, It’s A Long Way To Tipperary does not really work for me. Strike Up The Band provides a good album title, but Pete Rudeforth’s flugelhorn solo on Misty I like a lot. An interesting inclusion is Freddy Randall’s Lea Bridge Stomp, and for those who remember Freddy and Cook’s Ferry Inn in the Lea Valley will probably have their memory vaults tickled. The track is a tribute to Freddy Randall in whose band Jack Free played in the 1960s. The other tracks are Someday Sweetheart, Swing That Music, You Took Advantage Of Me, Basin Street Blues, I Dreamt I Dwelt In Marble Halls, and Up A Lazy River. Jackie Free provides vocals on a couple of the tracks and I found myself wondering whether the spirit of Ottilie Patterson has descended on a young singer somewhere who could audition for the band? This is one album you will not be able to buy online, but for £10 you can get it direct from Jack Free at 34, Rahn Road, Epping, Essex, CM16 4JB (Tel: 01992 573667). For a taste of the music, listen to Jackass Blues from the album on our Catwalk page (click here).